Dr. R. L. Kashyap is Professor Emeritus of Electrical and Computer Engineering at Purdue University, Lafayette, Indiana in USA. He had his Master’s degree from Indian Institute of Science, Bangalore and obtained Ph. D. from Harvard University. He is the recipient of many International awards. Recently he has received ‘Vedanga Vidvan’ award instituted by Maharshi Sandipani Vedavidya Pratishthan (Ujjain), an autonomous body of HRD, Govt. of India and ‘Jnana Keerti’ award instituted by Harsha Kriya Foundation, Bangalore. He has written extensively on Veda. He has to his credit eight major books on the Veda. ‘Why Read Rig Veda’, ‘Secrets of the Rig Veda’, ‘Krishna Yajur Veda Taittiriya Samhita’ (3 Volumes), ‘Exploring the Mystery of Gods’, ‘Rudra mantras’, ‘Essentials of Atharva Veda’, ‘Work Enjoyment & Progress’ are some of his major books. To help the reader, several brief essays are given in the beginning of the book. 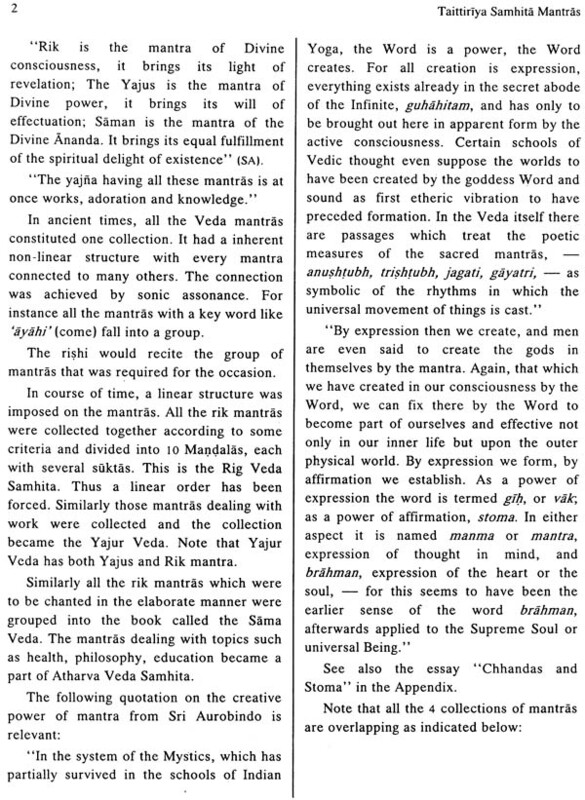 The first essay deals with certain aspects of mantra, its definition, types and powers. 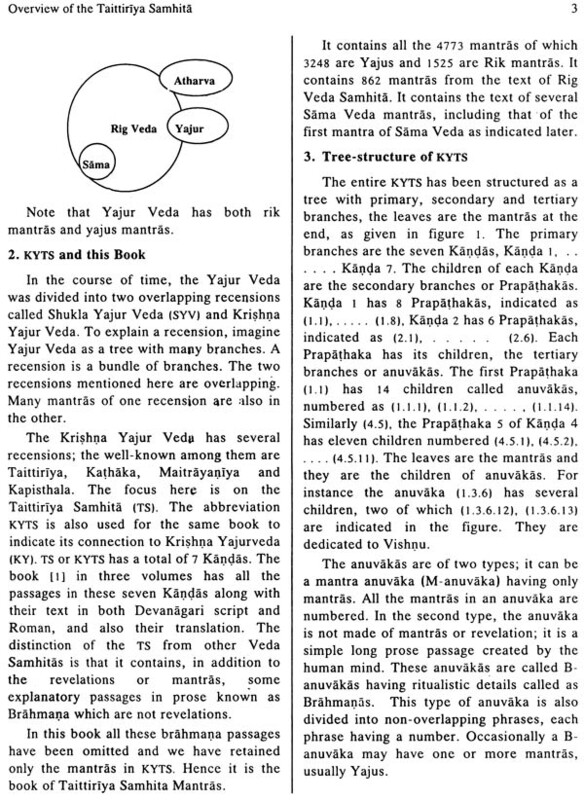 The second essay, ‘KYTS and this book’ shows the relation between the entire texts of KYTS in seven Kandas published as . 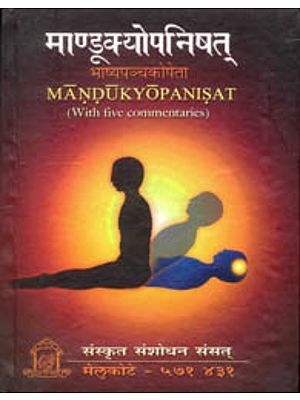 This book contains all and only the mantras contained in the three volumes of . The details of l I l are in the p. 534 in the section, ‘References’. The third essay describes the tree-structure of the KYTS. 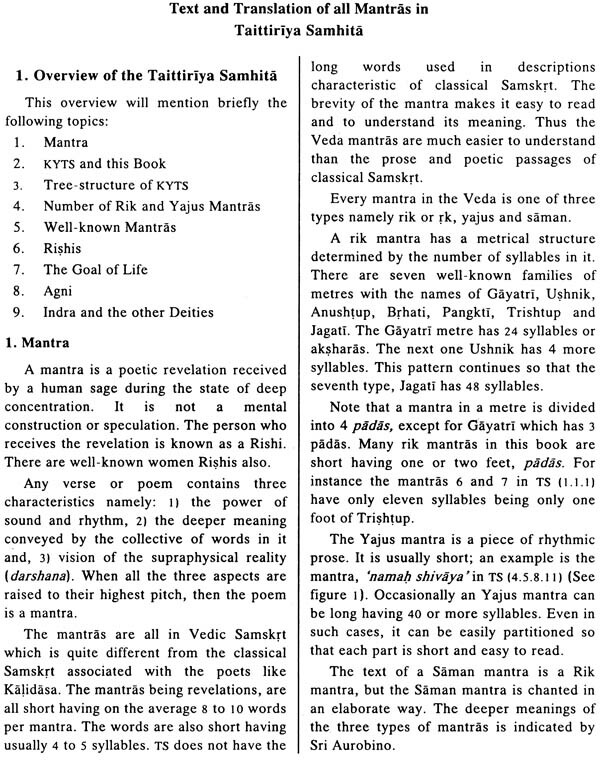 The fourth one gives the numerical information on the number of Rik and Yajus mantras in this book. 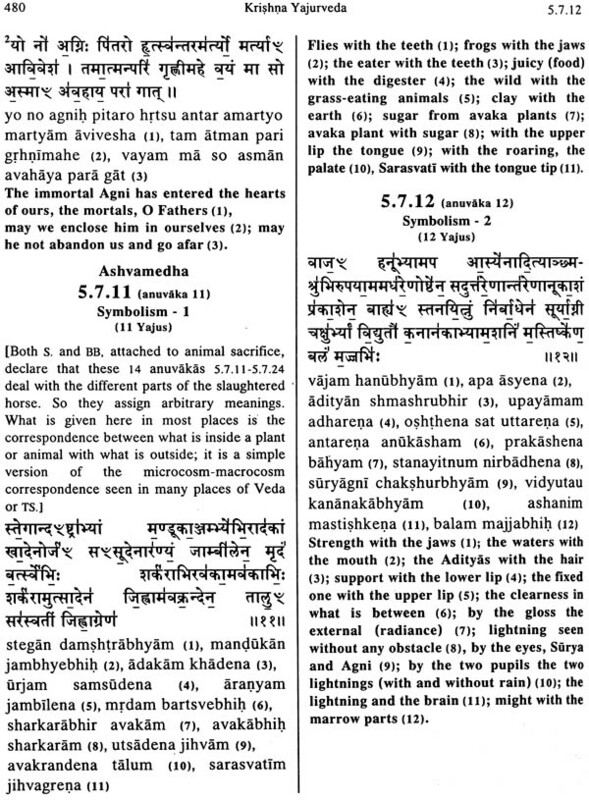 The essay 5 gives the place of occurrence of many well-known mantras from the four Vedas used widely in worship For instance the famous mantra of Ganapati Tryambaka, Vishnu, the waters, the mantra, used in Sandhya worship, the text of the first mantra of the Sama Veda and Atharva Veda occur in various places here whose locations are specified both in the essay an: in the figure 1. 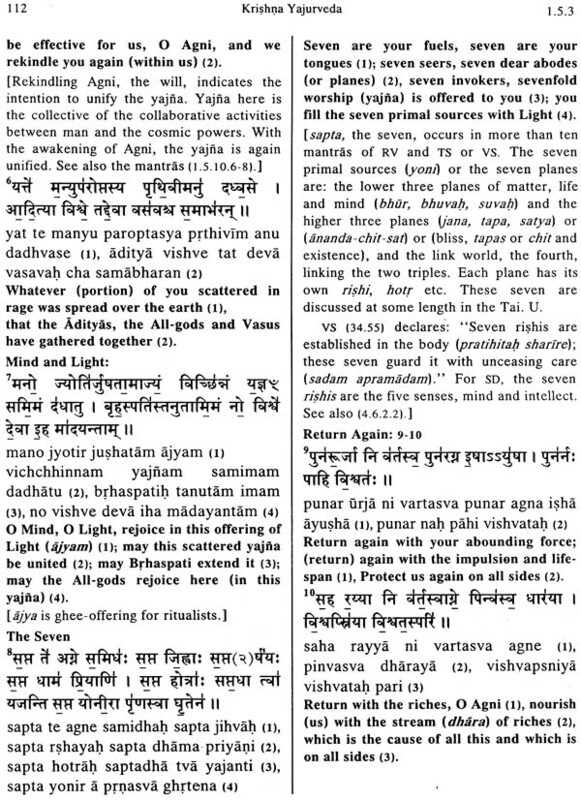 The essay 6 deals with the rishis to (whom the mantras of KYTS were revealed The distinction is made between the sage: who got the revelation of mantras (mantra drshtara) and those who compiled the mantras into Kandas (Kandarshi). The last three essays deal with the goal: of life as envisioned in KYTS along with pertinent information on the various cosmic powers like Agni, Indra, Soma, Aditi, Ashvins, etc. The appendices also have useful information. The first appendix, ‘Annotated references’ draws attention to the basic texts which form the basis for this book and also the books which can be read for more details on the topics discussed in this book such as the powers of the deities. 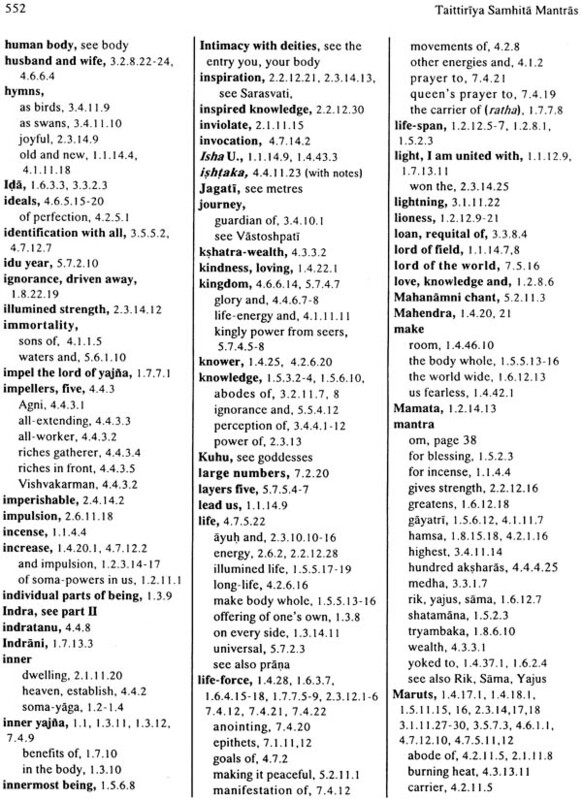 Ashvamedha forms the subject matter, directly or indirectly of almost a fifth of all the mantras. Ashvamedha is termed as a horse-sacrifice. The symbolism of the horse-sacrifice is well-brought in the mantras of KYTS quoted in this essay. 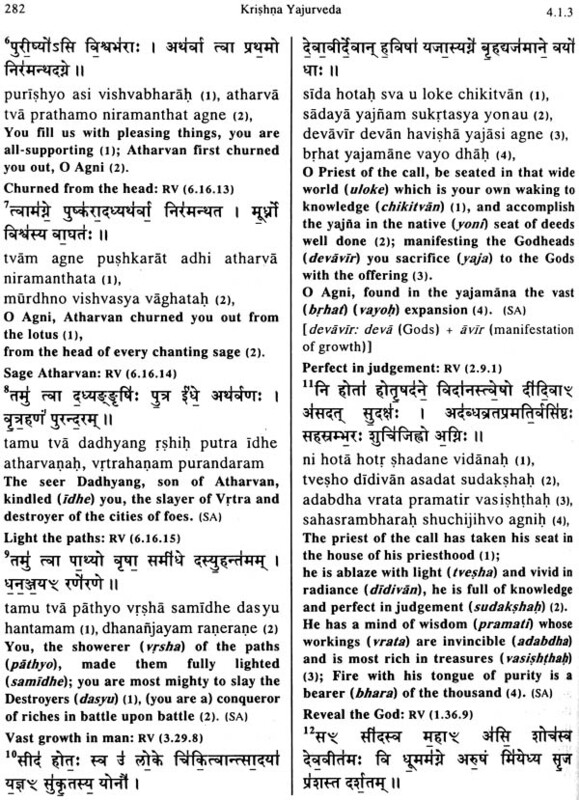 Ashva the steed symbolizes both the nation and also the entire manifestation as indicated in the last anuvaka of this book which has several passages from the beginning part 0: the famous Brhadaranyaka Upanishad. 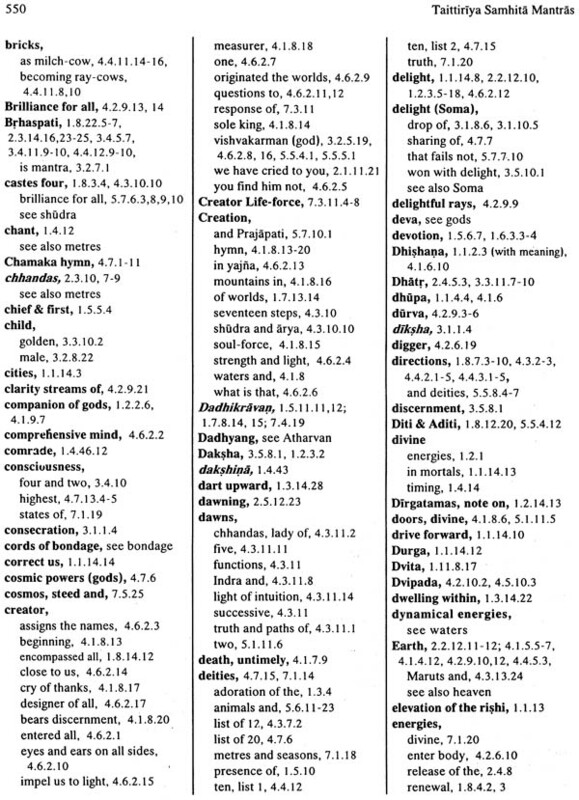 At the end there is the subject index and also the concordance of all the mantras of the Rig Veda text occurring in this book. 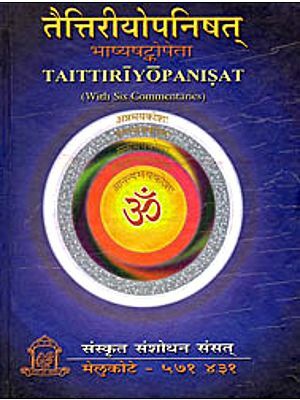 This book contains the text and translation of all the mantras in Krishna Yajur Vediya Taittiriya Samhita. It is based on the three volumes of the book [I] ‘Krishna Yajurveda Taittiriya Samhita’ (published by SAKSI) which contains both the mantras and the expository prose passages called Brahmana. Volume 1 of this book has been extensively revised and published in 2005. 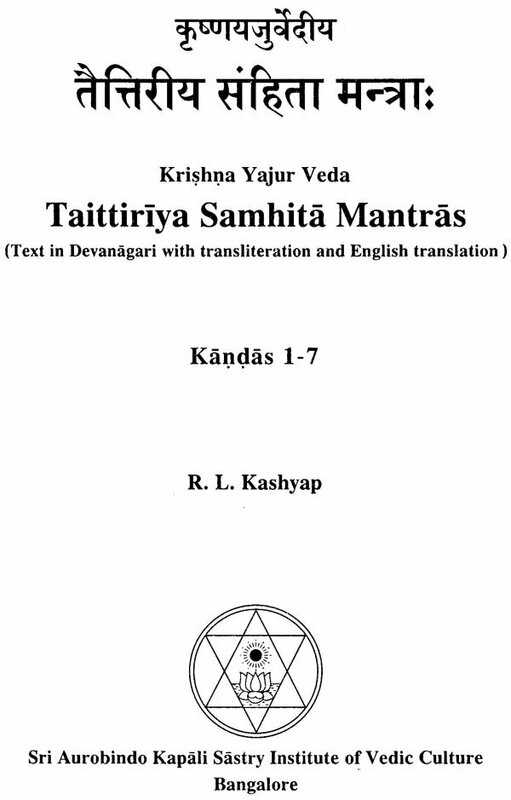 In this book, I have taken the translations of mantras in Kandas I and 2 from the revised Volume 1 and the translations of the mantras in Kandas 3 - 7 from Volumes 2 and 3 after revising them. In the section, ‘Overview of this book’, we have mentioned the four major features of this book. In addition, it has several other significant features. 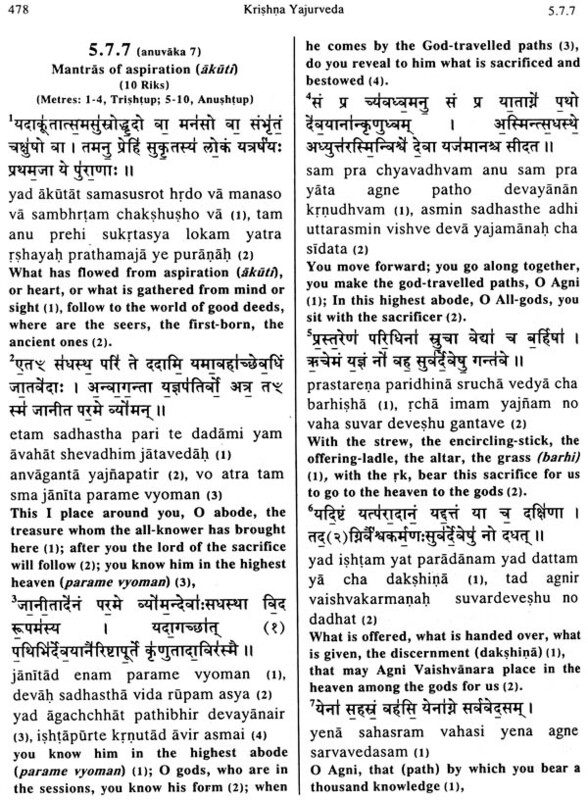 First of all, even though the Krishna Yajur Veda is dated more than 4000 years in age, this is the first time that there is a book which contains only the mantras of KYTS, without cluttering the mantras with brahmana or ritualistic expository passages. One can say that there is nothing great here since it is simply the deletion of Brahmana passages. However the situation is not that simple since both Yajus mantras and the Brahmana passages are in prose, and distinguishing them is not easy in many places. This is the reason that the book of this type has not seen the light of the day for the four thousand years. 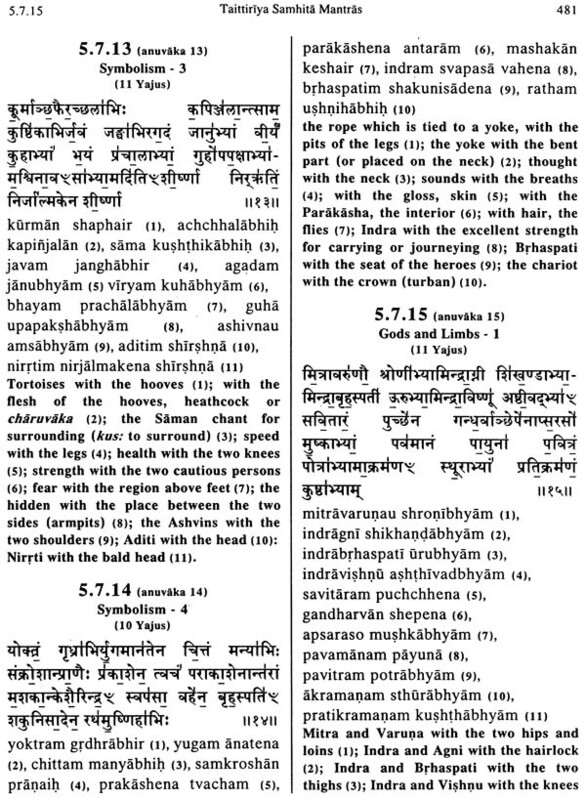 The ancient book in Sanskrit, ‘Apastambha Shrauta Sutras’ and the detailed essay by Daivarata  listed in Appendix 1 have given the outlines of the task in brief. 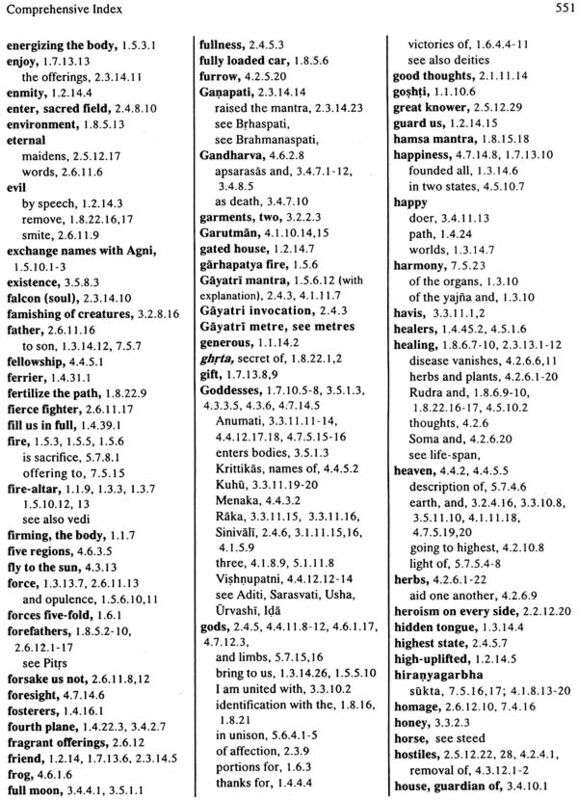 This demarcation of the mantras allows us to answer the often posed question, ‘How many mantras are there in the Veda books?’ as detailed in the essay in page [ix]. 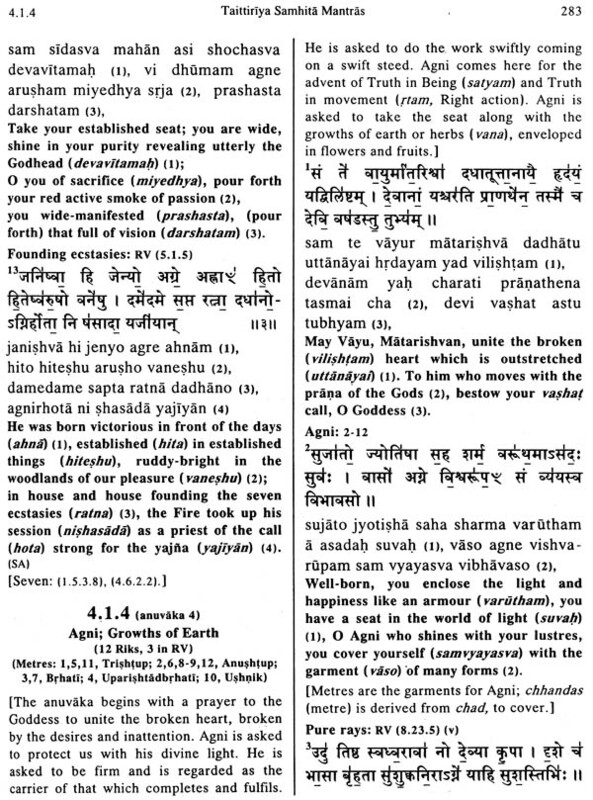 A characteristic feature of this Veda is that the same mantra may be repeated in several places. This feature is not unexpected since the same mantra could be used in different rituals both inner and outer occurring in different places. We explicitly point out the repetitions. 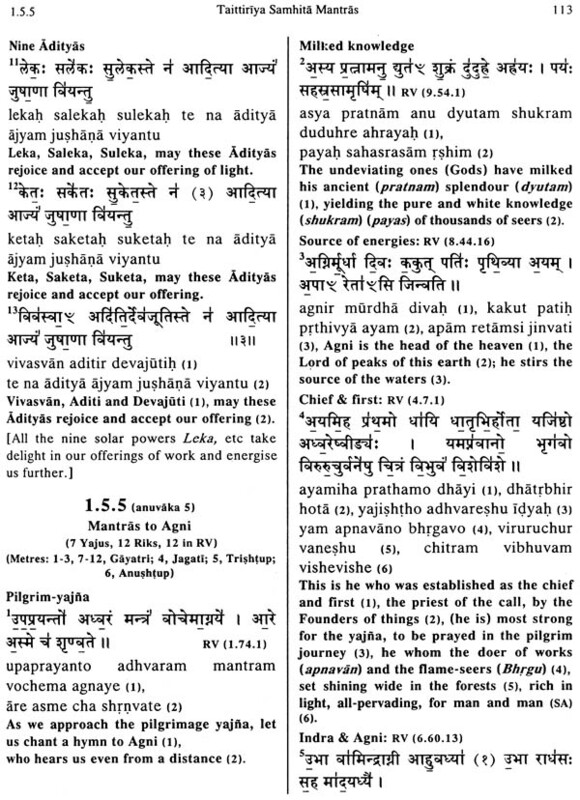 The third feature is that the details of every Rig Veda mantra occurring here are quoted with their (Mandala, Sukta, mantra number) references. Sometimes the mantra appearing in TS differs from the corresponding mantra by a word or two. In such case the symbol, ‘v’ is inserted after the RV reference indicating that it is a variant. 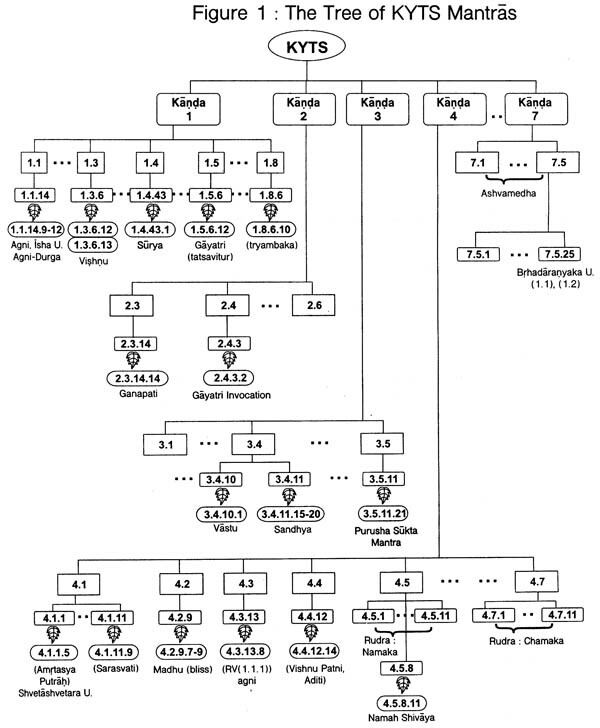 Note that Krishna Yajur Veda is the Veda lineage traced by many persons in the Southern and Western India. 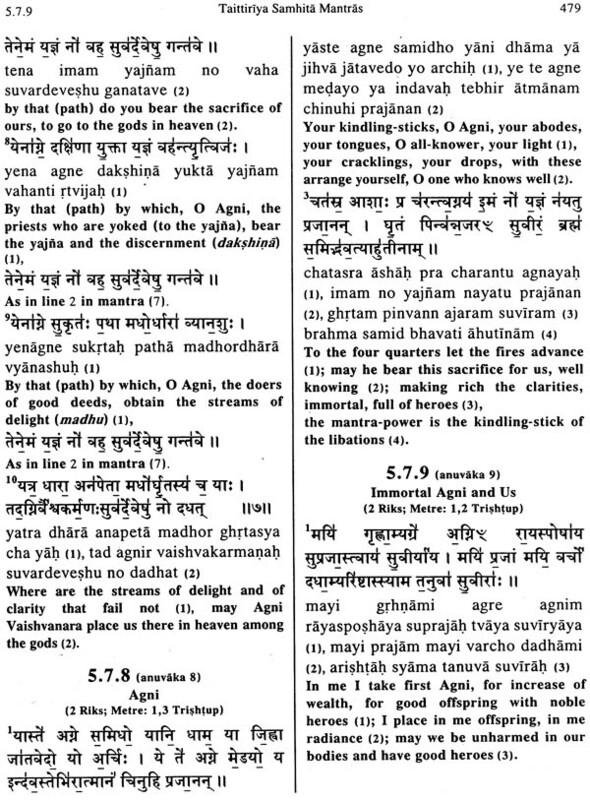 However in the Northern India, whenever the word Yajur Veda is mentioned it is assumed to be the Shukla Yajur Veda. It is well established that Krishna Yajur Veda is the older of the two, but because of the influence of Swami Dayananda Sarasvati, the Krishna Yajur Veda is completely ignored. 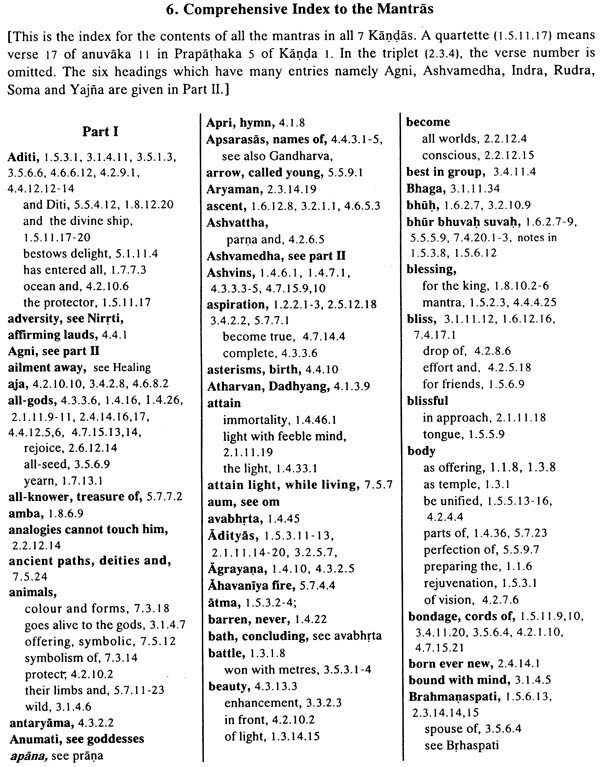 There is more than fifty percent overlap between the mantras of Shukla Yajur Veda and Krishna Yajur Veda. Our work offers an opportunity for preparing a concordance between the two and studies their connections. The study  is a first step. All the mantras of KYTS are viewed within the frame work of inner yajna occurring in our subtle bodies. There is no question of animal sacrifice. 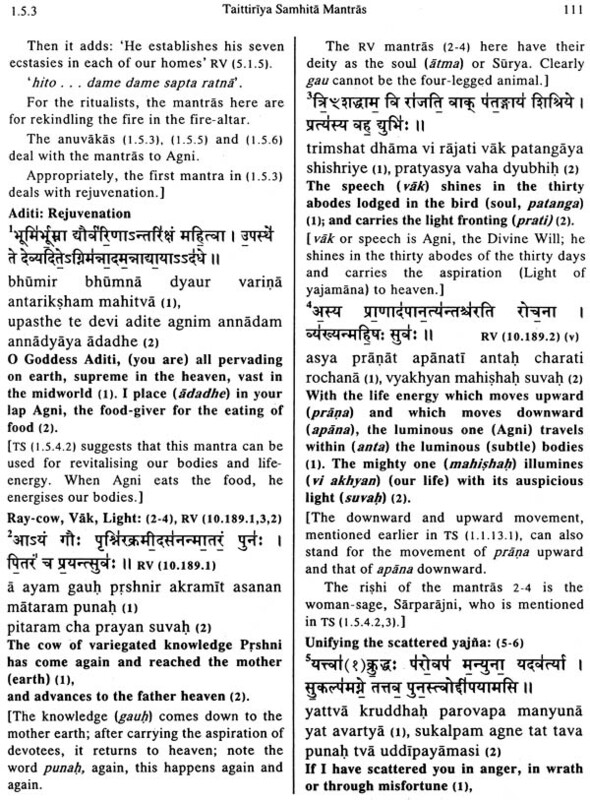 I quite agree that the mantras were used in many outer yajna rites as the agnicharya or Soma yajna mentioned here. But even these outer rites are symbolic of the activities occurring in our inner realm. The translation of the entire KYTS from a spiritual point of the view has been an uphill task in view of the fact that almost everyone views it as a book of only rituals. The main source for my work is the easy of Sri Aurobindo on the inner yajna in the veda and his translation in the Rig Veda mantras. I have quoted the translation and some excerpts from his works whose copyright rests with Sri Aurobindo Ashram Trust. The luminous essays of T.V. Kapali Sastry have been very useful. 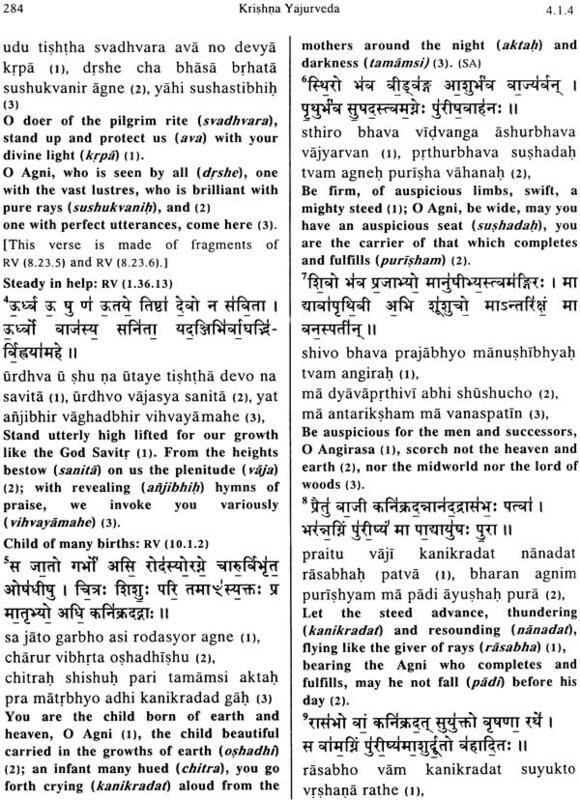 The translation of Keith and the commentaries of Sayana and Bhatta Bhaskara have been very helpful. I am particularly regretful to Prof. S. K. ramachandra Rao for encouraging me in my pursuits of the spiritual interpretation of the Veda. 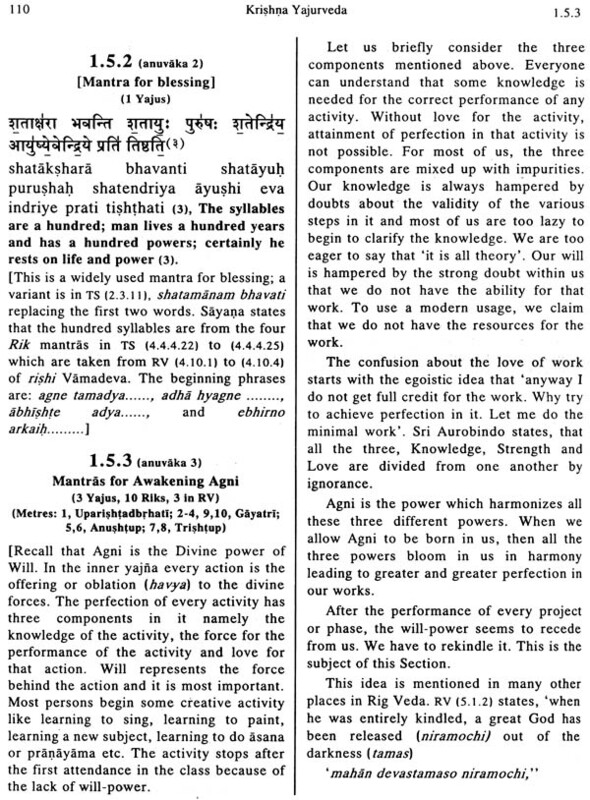 His kind remark on my translation of Rudra Adhyaya TS (4.5) given in  are very encouraging for me. I am grateful ti all te savants scholars who have written luminous forewords to the three volumes upholding its spiritual interpretation namely His Holiness Sri Sri Rangapriya Sripada Sri Srih, Swami Siddheshwarji, Professor K. S. Narayacharya, the eminent Western scholar and spiritual aspirant Sri Rand Hicks and Professor S. K. Ramachanda Rao. A copy of booklet containing all these forewords and benediction appearing in the three volumes of  is given free to all the buyers of this book. My profuse thanks to the staff of Saksi for patiently handling the numerous manuscripts versions of this work. I am thankful to eminent engineer Mr. T. B. Lakshman Rao for proofreading the Devanagari text of the mantras and their Roman transliteration. One can safely say that the devanagari text is error free. Thanks to the printers Sri Balakrishna for his cooperation an all stages of the work. Finally my thanks to the readers of the SAKSI books for their continuous encouragement and supports.